By standardizing on WatchGuard for network security, we were able to decrease the average installation time by more than 75 percent - now averaging anywhere from 15-20 [minutes] per site. We just plug the appliance in, it establishes a connection and pulls the configuration file. We are then up and running, and free to focus our time on testing credit card processing and access to approved web sites. Small businesses and remote locations have long been thought of as soft targets for attackers. WatchGuard Firebox T35 and T55 tabletop appliances bring enterprise-level network security to those small office/branch office and small retail environments that matches the reality of today’s distributed work style. Our unique product architecture enables smaller businesses to leverage best-in-class security services - from URL filtering and intrusion prevention to application control and data loss prevention - minus the cost and complexity of managing multiple single-point solutions. Cloud-based RapidDeploy technology, a configuration and deployment tool that comes standard with WatchGuard Firebox appliances, enables IT staff to create and store configuration data in the cloud - public or private - and have a new appliance directly shipped to its destination. Once the device arrives, it can connect to the cloud for a secure download of its configuration settings, saving staff travel time and money. This technology is particularly advantageous for large distributed enterprises where managing a multitude of devices efficiently across multiple locations and geographies is critical. Firebox T Series appliances are not only easy to initially configure and deploy, they are also designed with an emphasis on centralized management, making ongoing policy and network management simple and straightforward. WatchGuard Dimension, which is included with purchase, provides a suite of big data visibility and reporting tools that instantly identify and distill key network security threats, issues and trends so you can take immediate preventive or corrective action. Security is complex, running it doesn’t have to be. Wireless versions of the T35 and T55 use 802.11ac operating in the 2.4 GHz and 5GHz bands for high performance and superior reliability. 5 Gigabit Ethernet ports support high-speed LAN backbone infrastructures & gigabit WAN connections. PoE port to power a peripheral device such as a WatchGuard Secure Wi-Fi Access Point, allowing administrators to extend the reach of their networks without having to run costly AC power to the remote device. 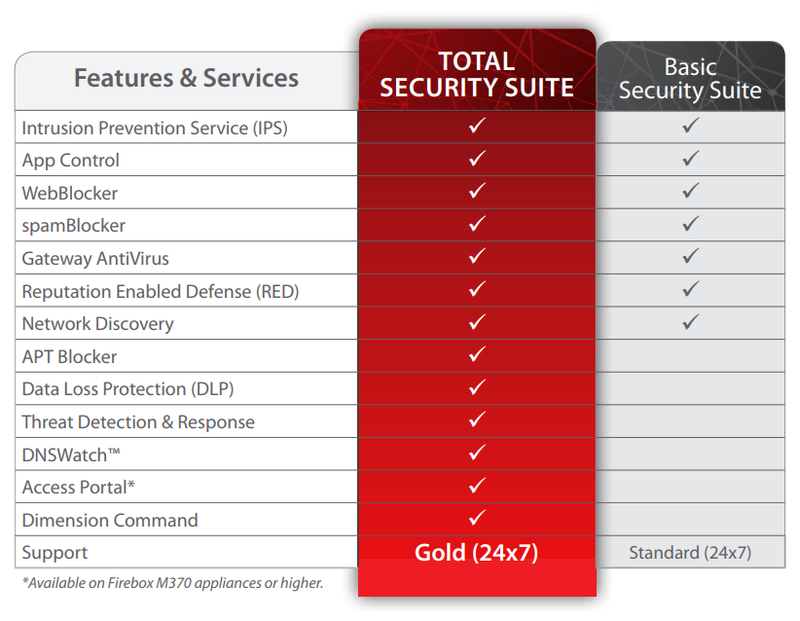 Download the WatchGuard Firebox T35 & T55 Datasheet (PDF).